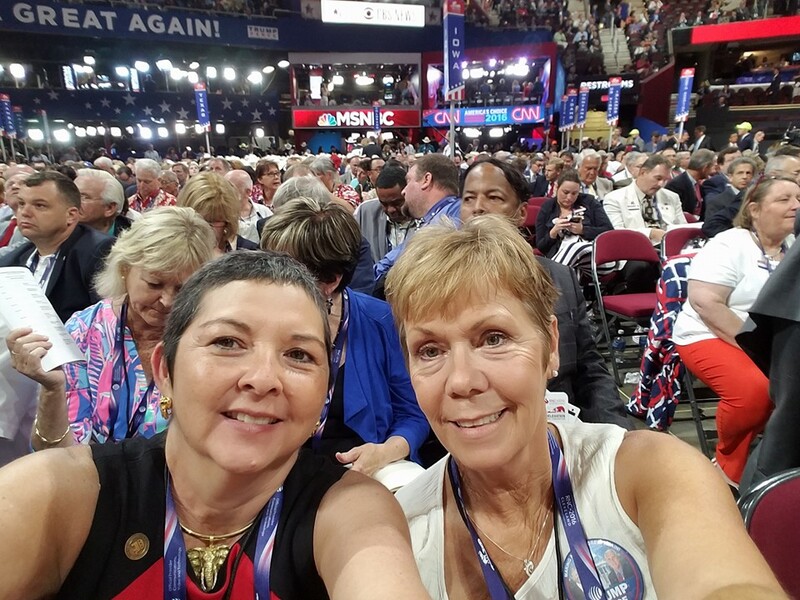 Maryland Republican Party Chair Diana Waterman and First Vice-Chair Mary Burke Russell sit with delegation on the convention floor. From Waterman's Facebook page. CLEVELAND — As Donald Trump seems primed to accept the nomination as the GOP’s 2016 presidential candidate this week at the Republican National Convention, party leaders are eying a problem: finding a way to coalesce the base around the controversial business mogul. Those problems reared their head Monday on the floor of the convention in Cleveland. At one point, party opponents to Trump began shouting for a roll call vote. They aimed to force delegates to vote on a procedural motion that had to pass before the convention could get underway. Making the vote a drawn out process instead of a foregone conclusion could have reflected negatively on Trump’s goals of unifying the party as prime time TV coverage of the convention began. Eventually the demand for a roll call vote failed. Jim Crawford, 68, a rules committee member from Bryantown, Md., said the rules roll call was an attempt to make a statement by disaffected Republicans. Video from Monday’s Maryland delegation breakfast. Anne Arundel County Executive Steve Schuh said at the Maryland delegate breakfast Monday morning that Trump was not his first choice in the 2016 Republican primary. However, as a party leader, Schuh said he must accept the GOP voters’ choice, as 60 percent of them voted for Trump in the state’s April 26 primary. “Those of us who represent Maryland have to bear in mind that was the primary voters’ (decision),” Schuh said. A short walk away from the convention center at Settlers Landing Park, supporters of Trump held an “America First Unity Rally” with the goal of bringing together the different factions of the Republican Party. Speakers included members of various minority and interest groups — such as Women United for Trump, Christians for Trump, Students for Trump and Bikers for Trump — that sought to diversify Trump’s base of support. Keynote speakers included Diamond and Silk, a pair of African-American sisters who have catapulted to internet fame with their fiery support for the presumptive Republican nominee on YouTube. A July NBC/WSJ poll found that African-Americans back Clinton over Trump by an 84 to 7 margin. But the high-energy duo said that the Democratic party does not have the best interests of black Americans in mind, and that they should no longer vote as a monolith. Milo Yiannopoulos, an openly gay conservative reporter for Breitbart News, stood before the crowd of about 100 and proclaimed that Trump was the best candidate for LGBT people. Yiannopoulos brought up the shooting at an Orlando gay club on June 12, which resulted in the death of 50 people, including the shooter, and injured another 53. Supporting a candidate that understands protecting the country’s borders, he said, is something all Americans must do, no matter their sexuality or political ideology. Diana Waterman, the state chairman for the Maryland GOP, said members of the Republican party must unite behind Trump, even if he was not their first or second choice. Avoiding a Hillary Clinton presidency, she said, must be the rallying call for Republicans.